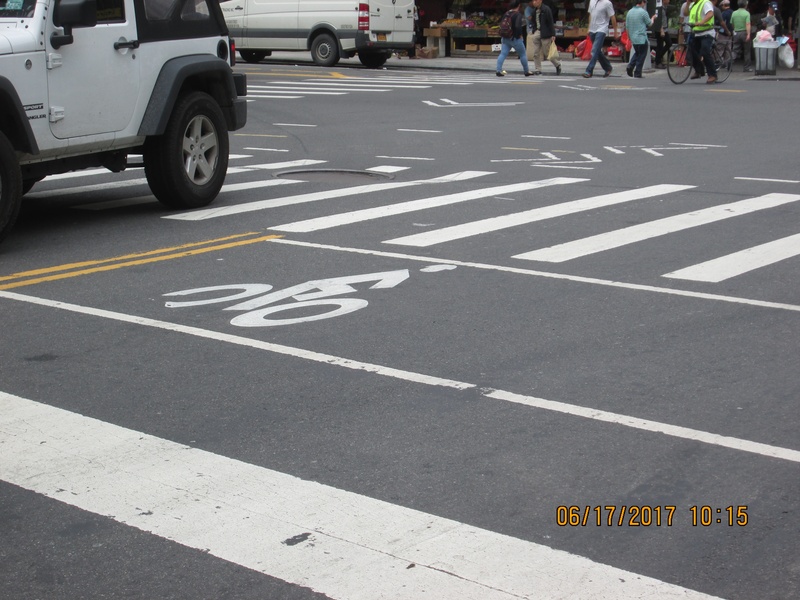 DOT has finished work on concrete pedestrian islands along Chrystie Street and has moved on to striping and painting the new two-way protected bike lane between the Manhattan Bridge and Houston Street. The project looks mostly complete, though there are some sections without green paint and not all the markings are down yet. 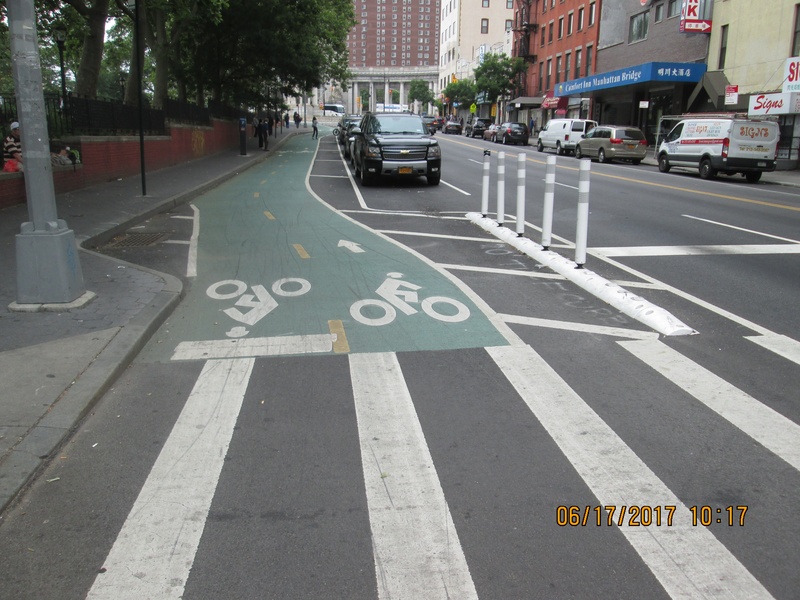 The Chrystie Street parking-protected bike lane replaces painted bike lanes that were constantly obstructed by illegally parked vehicles. The project also includes concrete pedestrian refuges at East 2nd Street, Rivington Street, and Stanton Street [PDF]. Markings delineating the buffer between the bike lane and the parking lane or moving traffic now extend for the entire length of the project, except for a short stretch just south of Houston Street, which is currently separated by jersey barriers. Jersey barriers slated for the southern end of the project, by the Manhattan Bridge, are not in yet. 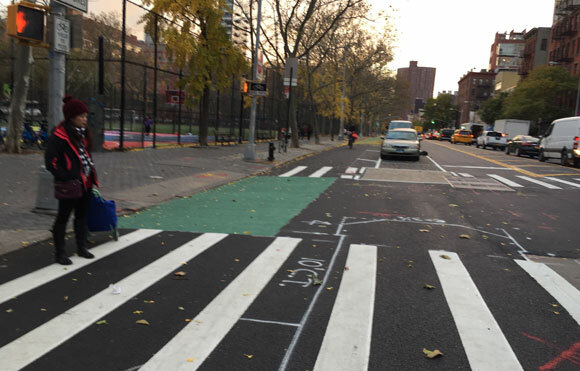 Also incomplete are changes to the Second Avenue bike lane between 2nd Street and Houston Street, which is supposed to be realigned along the eastern curb to better line up with the new position of the Chrystie Street bike lane. DOT crews were out at work last week, but thermoplast can’t adhere properly when temperatures drop below 50 degrees, so we’ll need to hit a warm spell for work to completely wrap up. 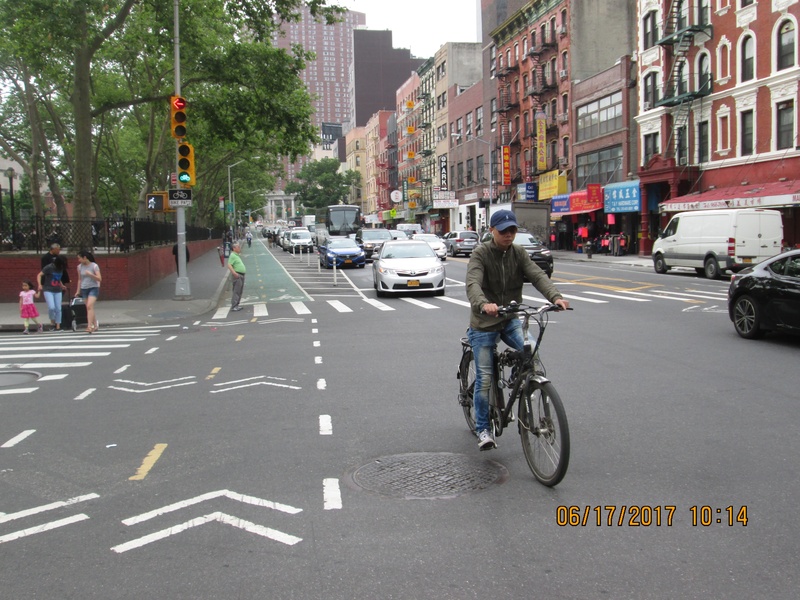 The idea for a protected bike lane on Chrystie Street, which connects around 3,000 cyclists each day between the Manhattan Bridge and protected lanes on First Avenue and Second Avenue, emerged out of Transportation Alternatives’ Brooklyn committee about two years ago. DOT’s eventual proposal, modeled after the volunteers’ suggestion, was approved by Manhattan Community Board 3 this past May. 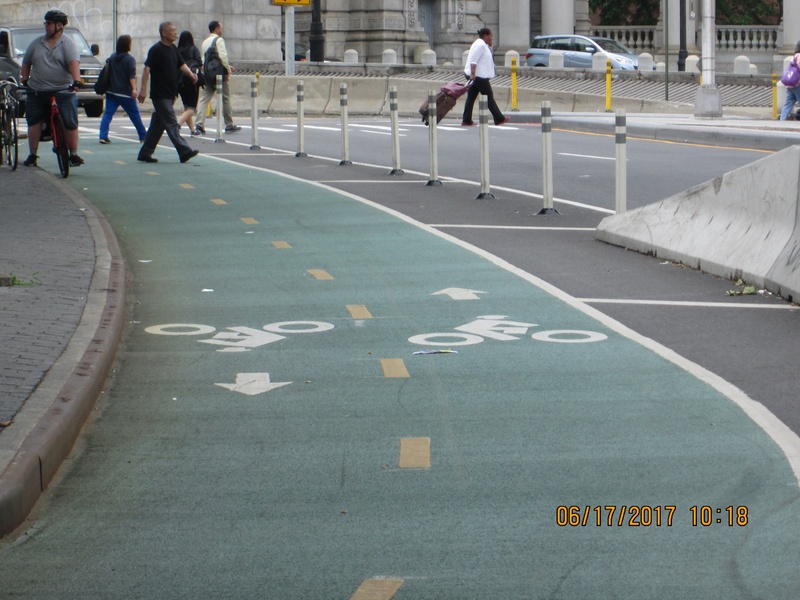 For about 50 meters south of Houston, there are no markings yet and the bike lane is separated from traffic by jersey barriers. Some drivers haven’t figured out how the new configuration is supposed to work yet. 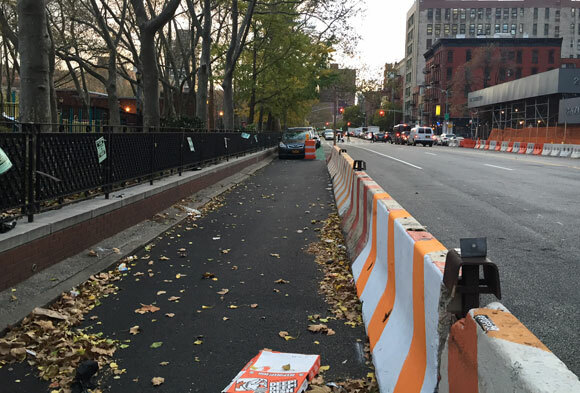 The Delancey Street approach to the Williamsburg Bridge bike path is slated for a two-way bike lane linking to Allen Street, as well as an eastbound connection from Chrystie Street.